Most men don’t travel with dressing gowns and instead wear the ones provided by the hotels they stay at. More often than not, the dressing gowns Bond wears are not his own. 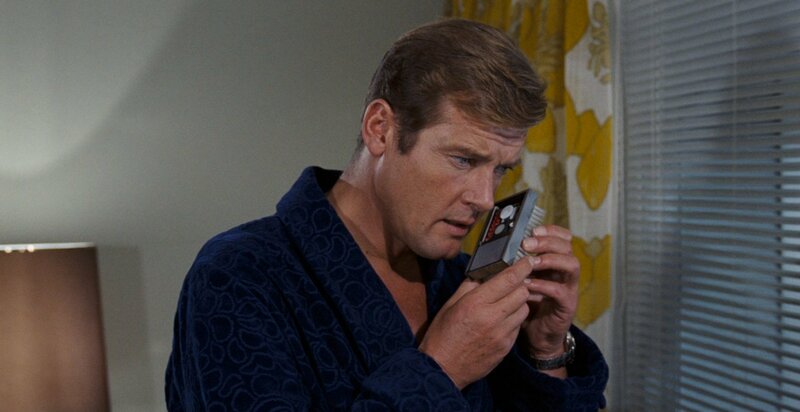 Some are nicer than others, and the one Bond wears in his hotel suite in San Monique is one of the more luxurious ones. It’s a rather nice dressing gown for one provided by a hotel, and even better hotels typically only provide basic terrycloth robes since they can easily be washed in hot water with the towels. This is a traditional dressing gown with a shawl collar and belt, and it has a breast and two hip patch pockets. Bond turns back the cuffs, which have a short vent at the end. The dressing gown is made from a dark blue plush material with a simple light blue embroidered paisley design. The pattern looks dated now, but not terribly so. 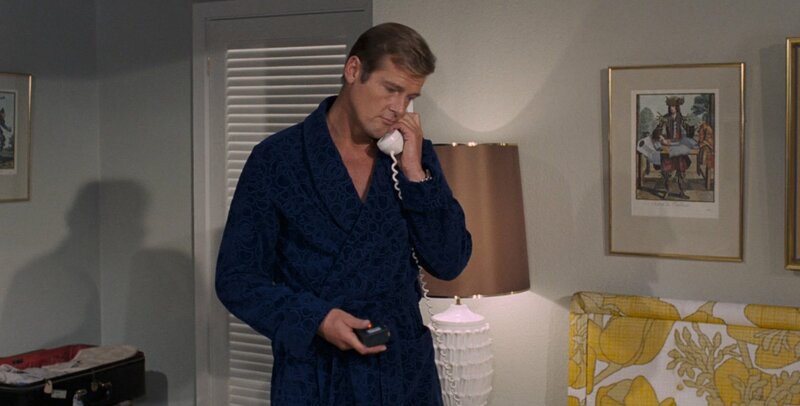 It’s a suitable dressing gown for a 1973 James Bond. I don’t really mind the paisley pattern. The dressing gown looks really nice and comfortable too. 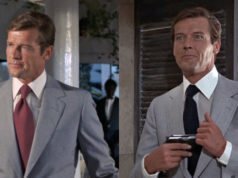 It’s too bad we don’t see Bond in nice loungewear or nightwear since, I guess, Moore’s era. I’d wear this for sure. Like Sean and Le Chiffre, I’d also wear this with no problems. An excellent dressing gown. A pity I’ve never come across one this nice in a hotel room. We see Bond in a disproportionate number of dressing gowns during Roger Moore’s first two outings when compared with the rest of the series. I suppose this is just a coincidence? It wakes me wonder if the gown is really that of the hotel as it does not match any colour pattern of the hotel : mustard and brown towels, white “furry” carpet, light tangerine jacket for Whisper as a valet…and it certainly matches Roger’s complexion. Le Chiffre, you are right, I miss nice lounge wear like this too. Perhaps Daniel Craig could have worn some in CR in the Bahamas while browsing M’s files or in QoS while opening the door to Mathis at the hotel. The girls in the cinemas surely enjoyed Mr Craig’s muscular bare chest but that attitude is not a gentleman’s!!! Another missed opportunity in Skyfall (but the whole movie was a huge missed opportunity…), as he’s being shaved, he perfectly could have worn a nice dressing gown instead of whatever he wore. Yet, as it is customary today since the XXIth century, whenever an actor has a nice/developped physique, it must be shown on the screen at repeated times. 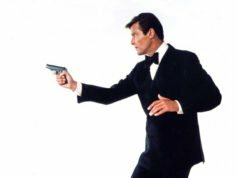 I hoped the Bond movies would have escaped the rule, but they didn’t. At least it not Craig’s fault. Just being curious, where are you from exactly ? I am from Paris myself. As to where I come from, we there have no objection in having champagne in jeans (especially the excellent “7 for all mankind” jeans): I live in Reims in the Champagne area. It is (almost) our everyday staple! This gown would not be in my luggage when I arrived at the hotel, but it certainly would be when I left. It reminds me of the fine gowns worn by tycoon types in their penthouses in films of the the ’30s. And by mobster Ben Diamond in MAGIC CITY.